When it comes to email deliverability, we used to talk about big issues: opt-in email list and list hygiene, ISP whitelisting, sender authentication (SPF, Reverse DNS Lookup, and DomainKeys), and email newsletter design. These factors play a very important role in the email delivery process and are worth our attention. However, there is one more simple yet effective tactic – get added to the recipient’s contact list or address book. It seems obvious but often times it’s overlooked by email marketers. When people add someone’s email address to their address books or contact lists, they are letting know their ISPs that they want to receive emails from that person. ISPs rely on those personal contact lists when sorting incoming emails and deciding whether to deliver the emails, reject, or move them to the spam folder. To protect their users from unwanted messages, ISPs will deliver only those emails that users want to receive in the first place. With all that said, a request to add your email to the subscriber’s address book should be an integral part of your opt-in and email marketing process. It should begin on your subscription confirmation page and continue through all the initial stage of your email marketing campaign. Post an “add-to-address-book” request on your “Confirmation required” or “Thank you” page. Your confirmation email may lost among other messages in the recipient’s Inbox. Emphasize your request and be sure to tell your subscribers that a confirmation or welcome message is on the way to them in order they don’t forget to check their mailboxes. Even better, if you can provide whitelisting instructions for different email clients directly on your confirmation or “thank you” page. This will make the whitelisting procedure quicker and easier. If you have the “add-to-address-book” instructions on some other page on your web site, don’t forget to link to that page from your “thank you” page. Include the request into your regular email newsletter. You can keep including the “add-to-address-book” request in the top line of the first three or four regular email newsletters that you send to new subscribers. In subsequent emails you can place a whitelisting request in your Email Admin center or simply in the email footer if you don’t include the Email Admin section into your newsletter. Send a separate email with the “add-to-address-book” request if you change your program. If you change the email service or ISP and your email address also changes, you must warn your subscribers about this change. It’s a good idea to send a separate email to them telling that your email address has changed and asking them to re-subscribe if they still want to receive emails from you. In this email ask them to whitelist or add your new email to their address books or contact lists. With WPNewsman you can send a re-subscribe request to your list with just a single mouse click and include an “add-to-address-book” request into the re-subscription email. It’s also a good way to wake up your inactive subscribers — by contacting them regarding some technical or administrative issues like email address change, subscriber’s surveys, or feedback addresses. There is one more important thing to keep in mind. Has it ever happened to you to receive confirmation or welcome emails from a “noreply” email address? As to me, I am not feeling at ease when I see a noreply@domain.com email in the “From” field. I think it’s a kind of neglect towards the recipient no matter how politely the request not to reply to this email address is phrased. People may want to contact you with their comments, help requests, complaints or whatever and may automatically hit the “Reply” button on your email. And moreover, they may habitually add your “noreply” email address to their contact lists. So, better if you avoid using a “noreply” email address during your subscription and welcome phase and send those first emails to your subscribers from your regular email address that you will be using to send them your regular newsletters. The whitelisting request is a normal email marketing practice and one of the things that differ good email marketers from spammers. Go to your spam folder and look spam emails through. Did you find many emails asking you to add their sender email to your address book? I guess not, if any. Spammers don’t usually request their email address to be whitelisted. It’s not their cup of tea. So, if you want to reinforce your legitimacy and confidence with your subscribers, include your whitelisting request and watch your email deliverability improve. Good news is that now you have a tool that can be of a great help for you to organize your opt-in process. With our G-Lock WPNewsman plugin you can place a signup form on your web site and collect subscribers using a confirmed opt-in process. What is nice about it is that all the settings – confirmation email, welcome email, confirmation page and “thank you” page – are pre-configured. 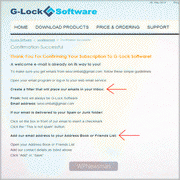 The confirmation page and “thank you” page already include the “add-to-address-book” request and instructions. You can customize those pages as well as email messages as you want to fit your marketing needs better. This way you will organically build your list of opt-in subscribers. And after you upgrade to WPNewsman Pro version you will be able to enhance your business and start sending email marketing newsletters to your subscribers.